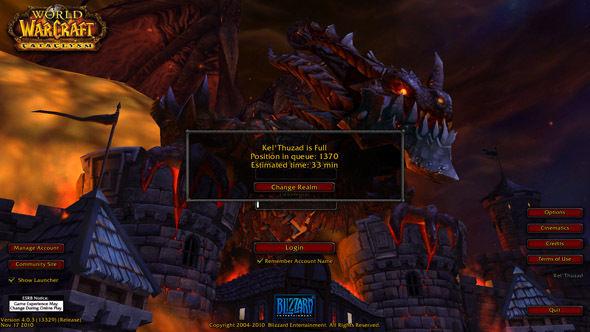 Our old friend the log-in queue has made a triumphant return! It's interesting to watch the pull that a WoW expansion seems to have on former players. They flock back to find old friends, favorite characters, and new content. The upside to this is that we have more people online to play with at all hours of the day. The downside is that log-in times can get ridiculous during prime time in the evening or on the weekend. One day it took me over an hour to get past the queue. It gave me some time to accomplish other things and catch up on my email, but an hour is still a long time to wait. The return of so many players just goes to show how Blizzard has a huge death grip on the title of most popular MMO in the world. It's hard to even remember most of the other games that released in 2004. It's unheard of for a game to stay popular as long as the World of Warcraft has, but it currently has something like 13 million subscribers. Congratulations Blizzard, somehow you keep everyone coming back for more. The other problem I've been running into is crowding in questing zones. The first day was a mess. 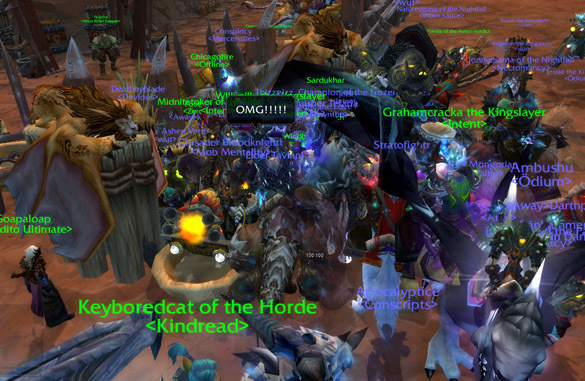 I couldn't even see quest givers because of the all people standing around and on top of them. Check out this NPC in Orgrimmar on launch night. Fighting over control of an area and rushing to tag quest mobs is a common occurrence at the moment. It's getting less so every day, but I've given up on questing during prime time. Truthfully, I don't mind it. I love seeing so many people interacting in a virtual world. That's what Massive Multiplayer Online games should be all about. In a few weeks the questing areas will quiet down and everyone will be queuing for heroic dungeons while hanging out in cities. My advice: Enjoy the company while it lasts.